Sputtering metal into moulds is another route, so long at the resulting rough surface texture is not an issue. Now Purdue is claiming both a smooth surface and sub-grain-sized detail from a technique called ‘roll-to-roll laser-induced super-plasticity’ enabling “the forming of smooth metallic circuits at the nano-scale using conventional carbon dioxide lasers, which are already common for industrial cutting and engraving”. The shock from a brief high-power laser pulse briefly induces ‘super-elastic’ behaviour in the metal, deforming it into the nano-scale features of a plastic mould, even at room temperature, independent of the original grain size. 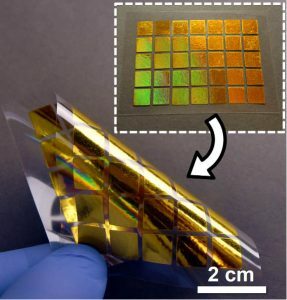 “In the future, the roll-to-roll fabrication of devices using our technique could enable the creation of touch screens covered with nanostructures capable of interacting with light and generating 3D images, as well as the cost-effective fabrication of more sensitive biosensors,” said Purdue engineer Ramses Martinez. 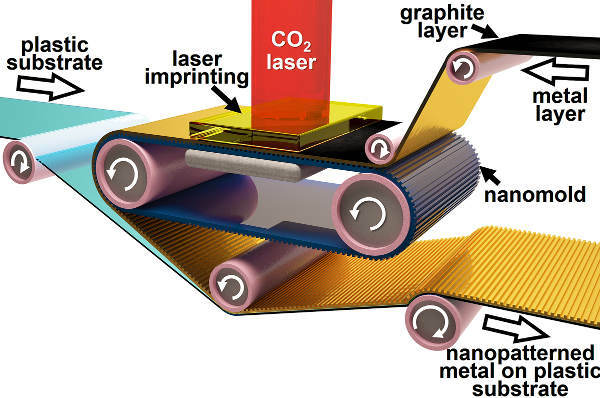 According to the paper ‘Roll-to-roll nanoforming of netals using laser-lnduced superplasticity‘, published in NanoLetters, gold plasmonic structures with aspect ratios as high as five were formed, that exhibited strong optical field enhancements.